Every year on the Faroe Islands  a semi-autonomous country consisting of 18 islands off the coasts of Norway and Iceland  a barbaric whale massacre takes place. 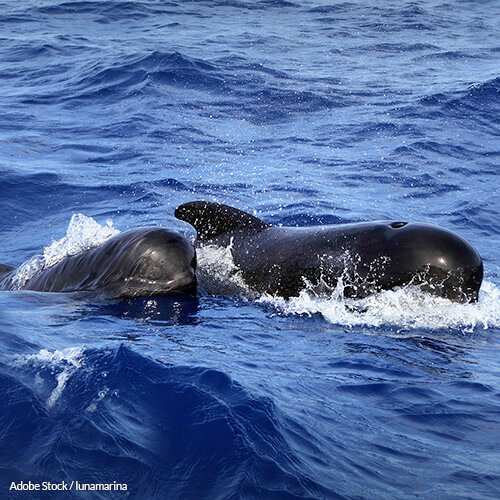 Hundreds of pilot whales are lured to the shallower waters of the Faroe Island bay, where they are then killed with knives. Locals slash and stab the whales' outer skin until the surrounding waters turn red with their blood . The annual Faroe Island whale slaughter, known as the grindadráp  or Grind, is one that dates back to the medieval period and is an event steeped in tradition for the Faroese. Many people come from all over the world to watch the slaughter, and when it's done, they eat the whales' meat. Whatever is not consumed at the end of the slaughter is simply thrown away. The Faroese are all but decimating an entire species  of precious marine mammals and it must be stopped now. Not only do these innocent whales need to be saved from slaughter, the hunt needs end to protect the health and lives of the Faroese themselves. High levels of mercury and heavy metal toxins in the whale meat can cause neurological damage, birth defects, and other harm . Whales are also social animals, which goes hand in hand with their intelligence. They live in structured groups, or pods, and work together for feeding, protection, and social interaction. These beautiful, precious marine mammals should never be murdered  they are far too intelligent, caring, and wonderful to be hunted for their meat. How could anyone do such a thing to a creature so smart and loving? Not only do these innocent whales need to be saved from slaughter, the hunt needs end to protect the health and lives of the Faroese themselves. High levels of mercury and heavy metal toxins in the whale meat can cause neurological damage, birth defects, and other harm . It's time for this barbaric tradition to come to an end. Sign the petition imploring Faroe Islands Prime Minister Aksel V. Johannesen to put an end to this barbaric event once and for all! I am appalled to learn of the pilot whale slaughter that takes place in the Faroe Islands every year. While I understand this is a longstanding tradition of the Faroe Islands, dating back to the medieval period, such a practice must not exist in today's world. To have hundreds of these precious marine mammals lured into a shallow bay where they become confused and disoriented, only to have them be victims of a mass slaughter is unthinkable. Faroese who participate in the grindadráp use large knives to kill and dismember the whales  even killing pregnant mothers and removing the babies from their wombs postmortem. but they have either stopped or changed their techniques quite a bit." There is also the good of the Faroese people to think about, with the health concerns connected to consumption of whale meat containing mercury and heavy metal toxins. The grind is nothing short of savagery and it must be stopped now. We cannot continue to allow these hunters to decimate a species so vital to the ocean's ecosystem. Please do the right thing and put an end to the whale slaughter now. The Faroe Islands will not be losing part of its identity or culture, it will be growing into a more humane one. That's 70,085 signatures! Let's keep the ball rolling.